Troopers said Heidi McGovern, 26, of Lee, stepped in front of a tanker truck while holding her 2-year-old son Enoch. Troopers said McGovern had left suicide notes behind at her home. UPDATE 10/5 5:45 p.m. – State police released the identities of a mother and toddler who were hit by a tanker truck Thursday on I-95 north of Lincoln in what police believe was a suicide. Troopers said Heidi McGovern, 26, of Lee, stepped in front of the truck while holding her 2-year-old son Enoch. Troopers said McGovern had left suicide notes behind at her home. McGovern died instantly, police said, and her son was critically injured. Department of Public Safety spokesperson Steve McCausland said Enoch was thrown from McGovern's arms, away from the truck, and landed in the passing lane of the highway. The boy remained hospitalized Friday at EMMC in Bangor with serious injuries. McCausland said the tanker truck is owned by Irving Oil and was driven by 59-year-old Kenneth Gray of Bucksport. The Irving truck was hauling fuel. The crash took place about 4:30 p.m. in Township 2 - Range 8, which is about four miles north of the Lincoln exit. McGovern was also the mother of an infant, who was elsewhere, at the time of the incident. CHESTER (NEWS CENTER Maine) — A mother in her late 20s was killed instantly Thursday when she was hit by a tractor-trailer truck along I-95 while holding her toddler, police said. Her son was critically injured and taken to Eastern Maine Medical Center (EMMC) in Bangor, Maine's Dept. of Public Safety spokesperson said. His exact condition was not immediately known. The crash happened about four miles north of the exit to Lincoln near the town of Chester. State police said the mother's car was parked in the breakdown lane, and investigators believe she and her son were struck by the truck while outside of the car in the travel lane. The woman's husband, from a nearby town, was notified by troopers and was at the hospital with his son, the spokesperson said. Names were expected to be released Friday. Troopers were still investigating the circumstances of the incident. The crash completely closed off I-95 northbound near mile marker 231 shortly before 5 p.m. Traffic was detoured at exit 227, which leads to Lincoln. Motorists were asked to seek alternate routes. 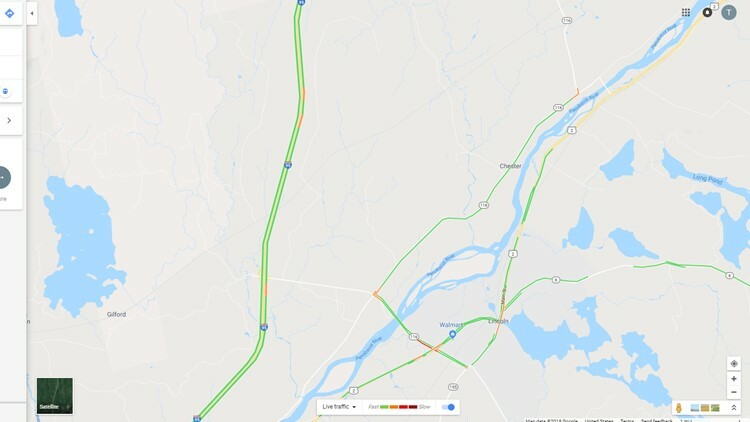 A screenshot of Google Maps' traffic feature at about 5:20 p.m. shows slowed traffic at the Lincoln exit and a few miles north where the crash likely took place.